Based in Toowoomba, Agridry is a manufacturer of grain dryers and aeration equipment for agricultural and commercial food processing industries. The Kinetic Series mobile grain dryers from Agridry provide outstanding drying performance and are ideal for growers or contractors that need high capacity equipment. These reliable and durable mobile grain dryers are diesel powered and are designed so that they can be towed on public roads as an agricultural machine. They also measure 10462mm (L) x 3445mm (W) x 4887mm (H). Kinetic Series mobile grain dryers also feature their own 3-phase power, air compressor, and high capacity swing out auger. The air bad suspension also facilitates ease of transport. 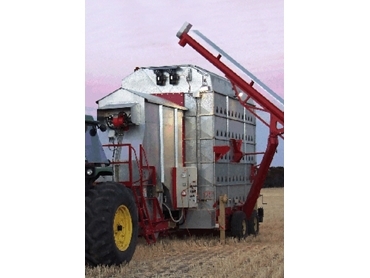 More information on the entire range of grain dryers is available from Agridry.